Fifth band in at The Albion Hotel was Foden’s Band, runaway winners of the Tameside Open Championship. With traffic in and around the Saddleworth villages, some brass bands choose to compete in the Tameside area Whit Friday contests. There is almost an equal number of venues in Tameside to the Saddleworth area’s agglomeration of contests. Whereas Saddleworth’s streets are narrow, this is less so at the Tameside venues. Some have off-street parking for the coaches. Most of them have smaller streets that are close to main roads. 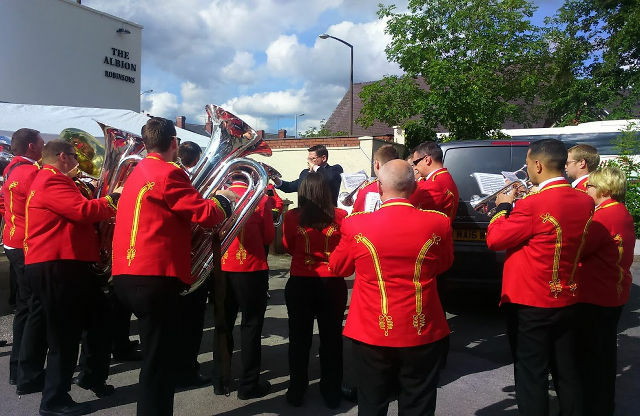 The Tameside area could claim to be the first part of Britain to host Whit Friday band contests. Its birthplace is Stalybridge; by 1884, Mossley, and Uppermill followed suit. With the added dimension of motorway access, the late 1970s to the early 1990s saw a boom in new venues. The Broadoak Hotel was one of the first ‘new wave’ venues in 1979. Denton Cricket Club followed suit. Others, less successful, included The Station in Ashton-under-Lyne, and the Cheshire Cheese in Newton. This year’s newest venue came as a surprise when I found out two months ago. One which didn’t need a bus or train for part of the journey. A godsend considering recent cutbacks to the 340 service, stymieing Stalybridge Labour Club, Carrbrook or Upper Mossley as possible venue options. Yours truly bore witness to the first ever brass band contest at The Albion Hotel. Which, this year, was Dukinfield’s second Whit Friday Contest. Before the Tame Valley became Dukinfield’s venue, Duki’s contest have been held at Dukinfield Town Hall and at The Black Knight public house (Lord rest its red triangular soul!). The latter was held from 1984 to 1987 and provided a suitable venue for most Dukinfielders. The organisation of The Albion Hotel’s first contest was very good. The turnaround time from alighting each coach to playing and boarding was impressive. Some bands were a little surprised by the lack of deportment march. Coaches pulled into Birch Lane, near the back of The Albion before parking on Jackson Avenue. A second coach could park on the lay-by outside Dukinfield Baptist Church. Two way radios were used by stewards to ensure the smooth running of each manoeuvre from booking in to departure. Food was well priced with drinks sold at the usual bar prices. The Robinson’s Unicorn cask bitter was on great form (though Wizard could have been a good, appropriate choice next to the usual bitter). Bands were introduced in the usual ‘Band number 21…’ fashion by Vinnie Moseley, The Albion’s landlord since 2008. As for the adjudicator, a Duki lad: Nigel Lawless, famed for his involvement in Fairey Band and James Shepherd Versatile Brass. The Albion Hotel’s first contest opened at 4pm with Ashton-under-Lyne Band playing George Allan’s The Wizard. This was followed by Silk Brass’ playing of Shipley Douglas’ Mephistopheles. Trentham Brass Band: Bramwyn (John R. Carr). For a new contest, there was a healthy number of Championship Section bands including the defending Tameside champions, Foden’s Band. Ashton-under-Lyne continued their hold on the Tameside Local Championship as well as winning the Best Local Band at the Albion Hotel contest. With 36 bands, the figures were above average for Tameside’s contests this year. That against established venues too. For the last forty years, several bands have passed the Albion Hotel en route to the M67 and (in more recent times), the M60 motorways. A contest at the Albion Hotel was a logical step. Last week, it bridged a yawning gap left by The Black Knight’s contest since 1987. Vinnie, Ann, the Contest Coordinator Adam Pickles, and everyone else involved in its organisation of the contest did a fantastic job. We hope next year’s contest builds on this year’s début. Here’s hoping it becomes an established Whit Friday venue on the Tameside contest circuit.